Slowing any car down from 120 mph one to two times puts some serious load on the OEM brakes, but for the most part they can handle it. 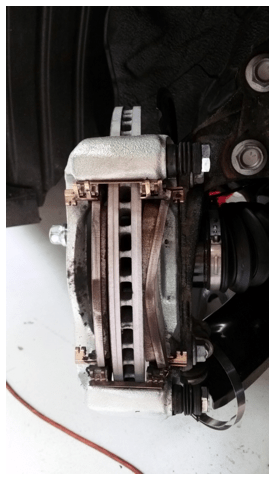 If you’re trying to slow down from that speed twice every 1.5 minutes over 25–30 minutes, however, you start finding the limits of the OEM brake real quick. On our Mazda 3, we had Cobalt Brakes make us special racing brake pads using their Xr2 compound for the front and Xr4 for the rear. We ran the Mazda 3 last year at the Daytona runoffs, and again at a local track day in the off-season early in 2016. 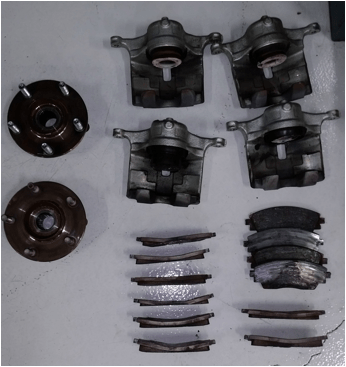 When we did a suspension inspection, we discovered the caliper pistons had some discoloration and cracks, and the inner brake pad had a bit of a bow to them from the extreme heat being generated. 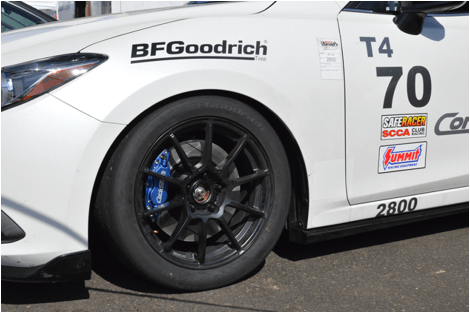 We’d been working on our Mazda 3 BBK and had a chance to test it out at Portland International Raceway in a race condition for a weekend, running one practice session, one qualifier, and three races. We found quickly that the brakes were generating a massive amount of heat and would require ducting, even with our BBK. Since the BBK isn’t legal in SCCA T4 class, we installed new Cobalt pads, rotors, and calipers, along with Motul RBF660 brake fluid, and hit the track for the SCCA Majors event in July. And, well . . . let’s just say the ducting is still not enough for the OEM brakes. Keep in mind that it only took two hours of track time for them to overheat. As you can see in the photo above (there on the right side), the inner pad was overheating so much it allowed the pad backing plate to bend, causing the center of the pad to wear out quickly. This is with racing brake pads meant for high temps and severe abuse! On the driver’s side, the pad material was gone. It was metal on metal. Here you can see the driver’s side caliper after the event. We lost 1/4 inch of the piston face where it contacts the brake pad due to heat. The rubber duct boot basically melted and burned up over the weekend from the temperatures. My point is that if you do any track events or even spirited driving, your stock brakes simply won’t hold up. If you do any high performance driving, which amounts to about two hours on the track (much like a race weekend), then you’ll need to upgrade your brakes. That is, unless you enjoy swapping calipers, pads, and rotors every weekend. 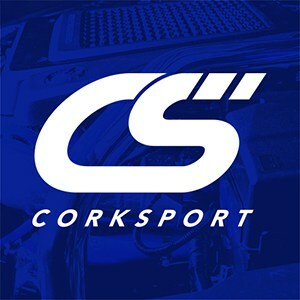 Even if you do only two high performance driving events, you’ll spend an equal amount getting the CorkSport Big Brake Kit. 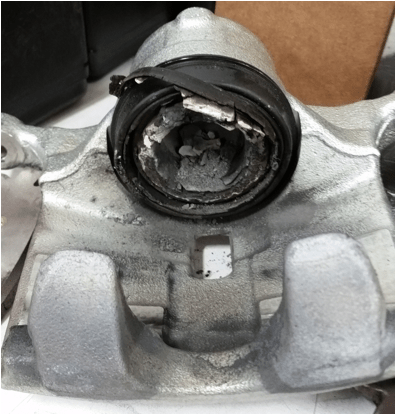 So before you hit the track in your Mazda 3, do two things: 1) Get some bigger brakes, and 2) install some brake ducts or your list of repair parts will look like this after a few weekends. We went to the track to put our 2014-2018 Mazda 3 big brake kit to the test. We show you what the stop components look like vs the affordable Mazda 3 performance big brake kit. We also show you it is important to make brake changes for performance driving.